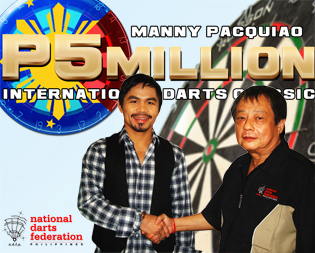 World boxing icon, Manny Pacquiao is sponsoring a record cash prize of five (5) million pesos in partnership with the National Darts Federation of the Philippines (NDFP) as the organizer of the biggest dart tournament in the history of Philippine darts the- Manny Pacquiao P5 Million International Darts Classic on November 27-30, 2009 at the air-conditioned Lagao Gymnasium in General Santos City. This is a historic breakthrough for Philippine darts and an enticement for worldwide darters to compete. Manny believes the Filipino darters are competent players that can make a name in the International dart scene with the proper support, encouragement and exposure. True to his words, the record cash prize of five million pesos is more than an encouragement but a motivation to strive for excellence. His tournaments since last year has been an inspiration to darters starting with the P300,000 Pacman I and II Series of 2008 culminating in the unprecedented Manny Pacquiao 2 Million Darts Classic in December of 2008. This year started with the support to the USA based Filipino darters with the $30,000 Pacmania I and the $100,000 Pacmania II while training in the USA. These were followed by the P300,000 in Malungon, Sarangani and the P300,000 in Alabel, Sarangani tournaments in the last few months. The level of competition will be extraordinarily high in this tournament with the influx of foreign players and the vastly improved local dart players brought about by the over 20 ranking events of the NDFP with over 2.5 M cash prizes, so far in 2009. The 2009 year-round ranking events of the NDFP provided the experience and the continuing preparation to meet the high standards of a truly international tournament. The Open Singles event has a total cash prize of 2M with the champion winning P700,000. Up for grabs in the Fix Four-Person Team event is P800,000 total cash prize with P300,000 going to the champion. The Fix Doubles will carry P500,000 in total prizes and the champions pocketing P120,000. On tap for the Classified Draw events are the Doubles with P500,000, Triples with 501,000 and the Four -Person with P500,000 (new event). The Free-Registration Youth Singles P20,000 and another new event the Non-Classified , no ranking points Seniors Singles P29,000 and the P150,000 Ladies Singles. The cash prizes for most of the non-singles events goes up to the top 128 players. We invite all dart players to General Santos City and be part of dart history. copyright 2009 www.ndfpdarts.com All Rights Reserved.